“We have long been a leader in football, hockey, cycling and snow head protection, and now we can lead the way in head protection for baseball, too,” said Easton-Bell Sports CEO Paul Harrington. Easton-Bell Sports designed the new helmet prototype to protect pitchers like Gunnar Sandberg, the 17-year old Marin Catholic High School student who suffered life-threatening injuries last March when he was hit in the head by a batted-ball while pitching. Gunnar made a triumphant recovery and is back on the field, but he and his family are now working to improve safety for baseball players to help prevent other families from suffering similar tragedies. “Although head injuries to pitchers and fielders are rare, when they happen they can be devastating and deadly,” said Bjorn Sandberg, father to Gunnar. Sandberg will be testing the Easton baseball helmet prototype for comfort and performance. Little League Baseball is also supporting the development of new helmet technology, citing their proud tradition of leadership in youth sports safety. “Innovations in the name of safety are central to Little League Baseball,” said Stephen Keener, president/CEO of Little League Baseball. 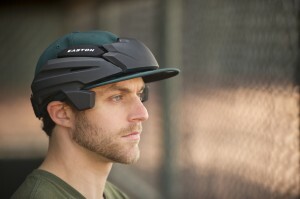 The Easton-Bell Sports pitching helmet prototype uses lightweight energy managing materials to provide protection to the most vulnerable areas of the head, without compromising comfort or performance. The helmet is made of expanded polystyrene polycarbonate, which is attached to a comfortable liner and elastic strap. The result is a product that provides protection, comfort and performance. The Easton Helmet Technology Center “The Dome,” formally opened in in Scotts Valley, California in fall of 2010, inspiring a culture of innovation across Easton-Bell Sports products. “The Dome” is a 55-thousand square-foot facility centralizing helmet research and development for all Easton-Bell Sports brands, including Easton, Bell, Giro, Riddell and Blackburn brands. “Dome” designers develop products for eight different categories including football, cycling, snow, hockey, lacrosse and baseball/softball. For more than 80 years, Easton-Bell Sports has demonstrated an unparalleled heritage in the research, design, development and manufacturing of head protective sports equipment, setting an unrivaled standard of excellence in technology and innovation. Easton Sports, part of the Easton-Bell Sports family of companies, is a developer, manufacturer, marketer and distributor of baseball, softball, hockey and cycling equipment for both professionals and enthusiasts. Easton focuses on its ability to innovate and create products of unmatched quality and performance including the #1 bat in the College World Series®, Women’s College World Series®, Little League World Series®, and Slow-Pitch Softball, as well as the #1 stick and #1 glove in the National Hockey League. Headquartered in Van Nuys, Calif., Easton Sports employs over 1,200 people worldwide and maintains facilities in Utah, California, Mexico, Canada and Asia. For further information, please visit the company online at www.eastonsports.com Easton Baseball. Thanks to Formula PR Inc.